Our guide Chloe was great. The other two that had reserved the tour did not show up so we had a personal excursion. Chloe was an exceptional guide and was fun and informative. She took a video of us riding the segways which we definitely enjoyed. We would recommend this excursion to anyone. This was not our first time for a Segway tour but was much different from our previous tour. The difference was that our first tour in Rome was on wide paths and lanes that was not crammed with pedestrians, bicycles,, cars, and merchants wares that you had to maneuver around. About 20 minutes into the tour my wife hit a pole causing her to fall off and we could not continue on. Even though we were wearing helmets, she most likely had a mild concussion. Later in the day, we met up with another rider from our ship, stating a man hit a obstacle in a cramped area causing him to fall off but was able to continue. He was an experienced rider as well. And then to top it off, we were told our guide also hit an obstacle and fell. Long story short, the tour is in a way too congested area. Great way to see Papeete and our guide, Chloe, was awesome and knowledgeable - we even shouted her a drink after the tour ! We were met by Chloe and given some instruction on balance and turning, stopping and going for3ward. Just two couples in the group and we headed across the main road up into the market, past the local Parliament and a beautiful park with ponds and gardens. Chloe was very informative and in front of the church we were informed it had actually survived an earthquake when everything else had been destroyed. Hmm makes you wonder! At the end of the tour Chloe bumped up the speed of our Segway's and let us have some fun on the lagoon esplanade, great fun. We had a ball and didn't want to surrender our trusty steeds. My husband still wants to buy one now we are home! Great fun. 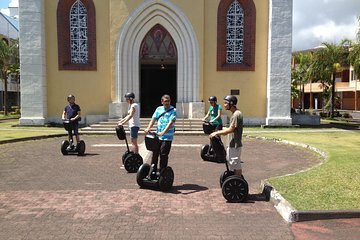 We had visited Papeete once before, but this Segway tour was an excellent way to cruise around the town. We felt like we saw much more than on our previous visit. We were also delighted to find that since our last visit they had built a new harbor-side park/pedestrian walkway that was perfect for a Segway tour. The only thing that could have been improved was a greater emphasis on safety. We had done Segway tours before, in Chicago and Indianapolis, but they were always done in a park and/or pedestrian-only areas. On this tour, they took us out on city streets and sidewalks where we were often encountering vehicle traffic and/or squeezing through narrow areas on sidewalks where we had to weave our way among LOTS of people on foot. Toward the end of our tour we came to an area where a construction project had shut down the sidewalk, which then required us to go out into the street and go against traffic in a very narrow area. While trying to avoid the oncoming vehicles, my husband's Segway wheel brushed up against the curb and the Segway began to spin and threw him to the pavement. He narrowly missed getting hit by a car! Fortunately he didn't break any bones, but he was very bruised and very sore for several days. The company needs to check its planned route each day before they take a group out so there are no surprises like closed sidewalks to deal with...that's just common sense. I will give praise to Viator,however. My husband's injuries were such that we were not able to take part in our planned jet ski tour the next day also booked through Viator. Even though we were past the deadline for canceling without penalty, I explained the situation to them and they gave us a full refund for the jet ski tour we missed as a result of the Segway mishap. Thank you. Learning to ride was fun. Leader was good. only slight problem was necessity to go in street due to construction work. Wow! What a great way of seeing the area. Great instruction, great guide and superb value for money. If you are worried about falling off - don't be! There were 2 guys over 70 on our tour and they had a ball! My wife and I have never been disappointed using Viator. We booked a 21 day cruise to Hawaii and then sail to Tahiti and surrounding islands. While on Tahiti, our cruise ship did not have any shore excursions. We looked at Viator web site and found a 2.5 hour Segway tour of Papeete, Tahiti. We loved it! The local contact Viator used was Maevaride and the tour guide's name was Chole. She was a wonderful host and ensured we were comfortable operating the Segway prior to the tour. She provided water and a helmet and on the slow speed of the Segway we zipped around the city. Once we were more confident of operation the Segway Chole asked if we wanted to go a bit faster. We said yes and the programed the Segways to go a bit faster - but we still had complete control of the speed. Chole answered all our Papeete questions. Some questions stumped her and she got on here cell phone after we stopped and found out the answer using Google or other means. Overall the tour was a huge success. My wife and I highly recommend it and we are 67 years old. We are attaching a group photo of us with Chole at a site in Papeete. Awesome way to see the city. Guide was fantastic. Really new his history and local stories. Showed us some very pretty government buildings along the boulevard plus especially loved riding along the harbour side and waters edge. Even got to see the markets and buy some pearls. Very fun time on the Segway! After a training lesso, we were off to see the local attractions in Tahiti. We rode around town, saw the church, the presidential palace, the market, Bougainville Park. Segways are new to the area, so many of the locals were amazed to see something like this and many were inquiring about them. At the end we were able to ride them at a higher speed around the square. This part was great! Helmets and water were included. Very nice tour guide. Bring sunscreen! !